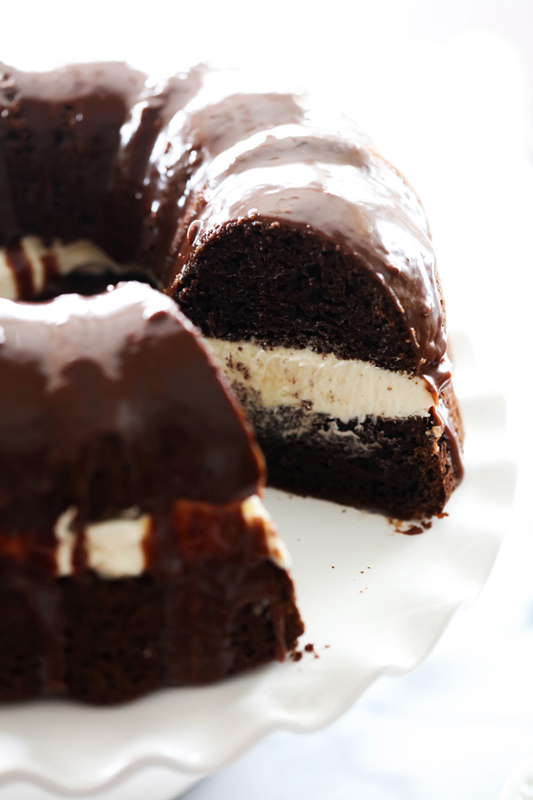 This Ding Dong Bundt Cake is unbelievably amazing! 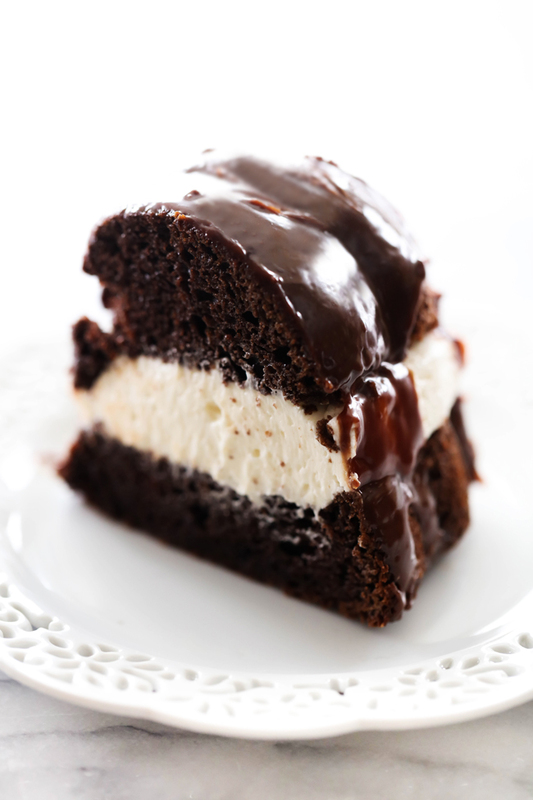 The chocolate cake is extremely moist and the cream filling is completely made from scratch and tastes incredible. It is topped with a rich chocolate ganache. This cake will become a new staple. Bundt Cakes are my favorite kind of cakes. Especially my recipe for them. It takes a boxed cake mix and completely jazzes it up. It also enhances the moist texture and keeps you coming back for more. Growing up, My mom ALWAYS had Hostess ding dongs and Hostess cupcakes on hand. Whenever she needed a quick chocolate fix, that was her go too. As she and I were brainstorming a dessert for a huge family gathering we had recently, we decided to make a bundt cake version of one of our favorite Hostess treats. Let me tell you, It turned out FANTASTIC! The cream filling is a star component to this dessert. It starts out with a roux made on the stovetop and then later added to the remaining ingredients. It is fluffy and very delicious. 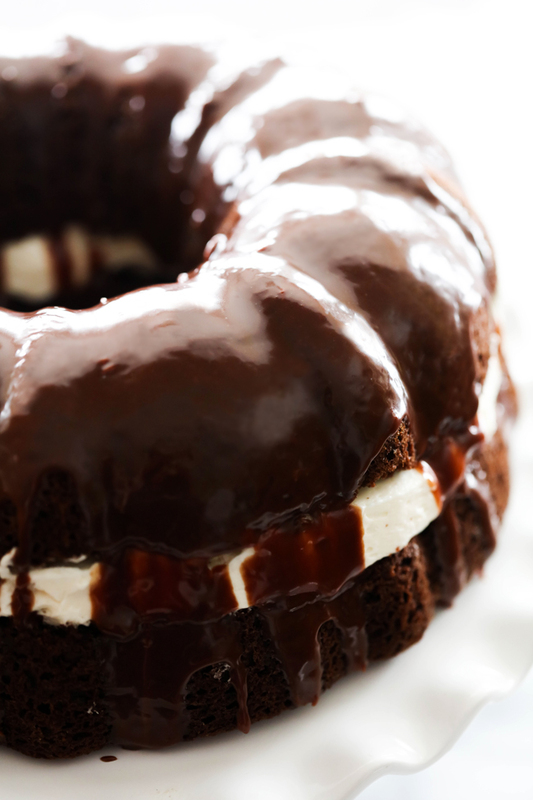 It goes perfectly with the chocolate fudge bundt cake. The ganache poured over top is the perfect addition to balance out the sweetness. I like to use a blend of milk and semi-sweet chocolate chips for this recipe. I promise I am not exaggerating when I say that this Ding Dong Bundt Cake was served to about 8 people and was gone in under 10 minutes. People went CRAZY over this Ding Dong Bundt Cake and I know they will for yours, too! Grease a 12-cup bundt pan with butter and flour or something like Baking Joy cooking spray. Pour milk and flour into a medium sauce pan and whisk together very well to make sure there are no lumps. Place pan on stove and turn the heat to medium and stir constantly to make a roux. Remove from heat and add vanilla. Allow to cool. While the mixture is cooling, cream butter and sugar together in a medium bowl for about 9 minutes. Add the cooled roux to the butter mixture and beat again until it is well blended and the sugar is completely dissolved. Carefully cut the cake in half and remove the top half and set aside. Spoon filling over the bottom of the cake and then spread evenly. Pour in chocolate chips and stir until melted and smooth. Carefully place cake back on the wire rack with paper towels under it. Drizzle Ganache Frosting over cake. After the frosting is set carefully move cake to cake stand or serving plate. Refrigerate cake for 1 to 2 hours before serving. OMG.....I woke up to your post this morning....this looks amazing. Thank you for sharing. This LOOKS and sounds amazing!!! Your desserts are always top notch! Made it last night for our Easter celebration. FABULOUS! Was a major hit. Beautiful and delicious. You compared it to a ding dong, but everyone compared it to a bump cake (is that a Michigan thing?). Meant to take a pic when it was plated, but did take one after the ganache. Wouldn’t change a thing with the recipe. 5/1/18 I just made this cake last night and we had it tonight for a friend's birthday. It was a HUGE hit. Everyone loved it. It DOES taste just like the Hostess cupcakes from our childhood. I just love your recipes and enjoy making and sharing them with my family and friends. Thank you! This cake is awesome! I made it for my Birthday and it turned out perfect! I am making three of these for a baby shower. Am I going to need to keep them refrigerated overnight? This cake is amazing! I did only use devils food chocolate cake and only milk chocolate morsels. I made this cake this past Sunday, and already making 2 more. It’s has just the right amount of sweetness. This recipe will be a definite go to. Again, absolutely amazing. Thank you!! I’m getting ready to make this cake with your recipe. I have a question though. Under the ingredients you said a small box (3.9 oz) Instant chocolate pudding mix. My small box shows 39g for the weight or 1.4 ounces. I think this is the one you’re referring to. Is this correct? I can’t wait to taste this and I don’t want to mess it up. Thank you. Made this first church. Most delicious! I wish I could include a pic!! I am making this tonight, instead of pumpkin pie. I can’t wait to see how it turns out! I’ll come back and update with how it goes for me. Merry Christmas! Can you make this the day before. If so, do you refrigerate until serving time. Thanks for your help. I am making this as I type. Spot on recipe! Fabulous texture! Husband and father in law are both big boys... they both told me they can't wait to "smash it" Translation..... eat it ! My dogs are going nuts over the fabulous aroma in the house. And my Kitchen Aid mixer is almost done with the creaming of my butter mixture. My anticipation is getting the best of me.